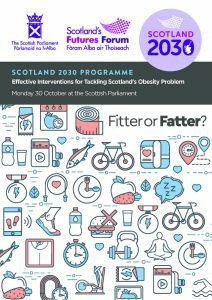 On Monday 30 October 2017, Scotland’s Futures Forum and the Scottish Parliament Information Centre brought together MSPs, academics and other stakeholders to look to 2030 and beyond and explore the policies that will make the biggest difference in tackling Scotland’s obesity problem. 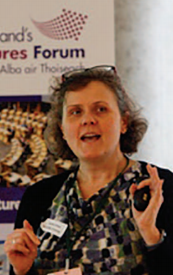 Looking at education and urban planning as well as the health impacts of obesity, the seminar took a broad and long-term approach to one of Scotland’s major challenges. Kate Grant stated that 29% of adults living in Scotland are clinically obese and that interventions are needed now to reduce obesity. The event therefore would focus on the question: What interventions does Scotland need to introduce now in order to reduce obesity by 2030? The breakout groups would discuss the four most popular interventions from a survey of academics conducted by SPICe earlier in the year. The choice of interventions was designed to stimulate the debate, as the survey indicated that – as highlighted by many others – multiple interventions need to be introduced now in order to meaningfully reduce obesity by 2030. 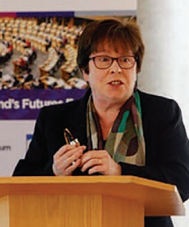 Professor Haggarty spoke about the obesity issues facing Scotland over the next 15 to 20 years. Professor Haggarty noted the significant and growing economic, health, wellbeing and social costs related to obesity. Public Health England estimated that the annual spend on the treatment of obesity and diabetes in the NHS is greater than the amount spent on the police, fire service and judicial system combined. The UK-wide NHS costs attributable to overweight and obesity are projected to reach £9.7 billion by 2050, with wider costs to society estimated to reach £49.9 billion per year. For Scotland the estimate is £4.6 billion. In 2015, 68% of men and 61% of women in Scotland were overweight or obese (25% and 29% respectively were obese). 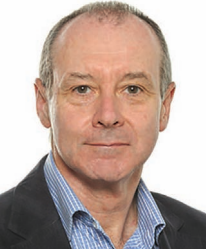 Professor Haggarty showed the results of recent global modelling, which demonstrates a steep rise in mortality with any increase in Body Mass Index (BMI) above healthy levels, and how this related to the Scottish BMI distribution. Obesity rates have been relatively stable since around 2009, but the nature of obesity is changing. 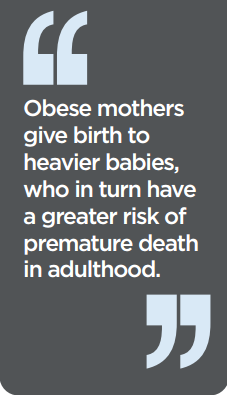 Younger generations are becoming obese at earlier ages and staying obese into adulthood. The increase in obesity incidence before 2009 has yet to fully manifest in poor health as many chronic diseases take decades to develop. We are therefore likely to see increases in obesity related ill health for some time. 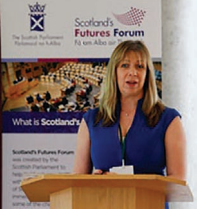 Lorna Aitken spoke about the work under way to embed healthy food habits into the school curriculum Scotland is at a critical point with the current review of both the Scottish Government’s obesity strategy and the regulations on school food nutritional guidelines. Ms Aitken shared a timeline of school and food education to set the context some historical context to the place of food and nutrition within schools, including the relatively recent inclusion of any consideration of food education and a link to the catering provided in schools. Welcome work is now under way through the Food for Thought and Developing Scotland’s Young Workforce initiatives. However, in the Scottish Education Survey, primary schools referred to a lack of: onsite facilities; staff training and confidence to deliver practical cookery; time to plan and prepare practical cookery; and funding for food experiences. In secondary, there was a critical staffing situation, a lack of funds to deliver the curriculum entitlement, a problem with the image of the subject and time barriers for delivery of sessions. As Ms Aitken asked, who could effectively teach a class of pupils to cook a meal from scratch and clean up afterwards in 50 minutes? Heather Peace talked through the role of Food Standards Scotland and the scope of its work over the next 15 to 20 years to address obesity. Food Standards Scotland is Scotland’s food body responsible for food safety, food authenticity and nutrition. 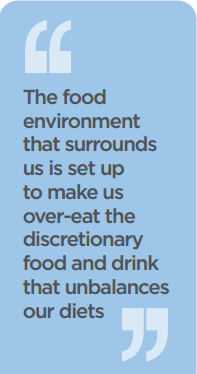 Uniquely, it has a duty under to improve the extent to which consumers have diets conducive to good health, and this takes the FSS into the debate about improving Scotland’s health. In January 2016, FSS proposed a package of measures to Scottish Government ministers on how to tackle obesity. The recommendations, based on analysing the available evidence, including from the FSS dietary surveillance programme, fell into two broad categories: education and the food environment. Education and the provision of evidence-based advice is a core function of FSS. It provides advice on diet and health to consumers, ministers and stakeholders, and it contributes to nutrition education via schools, in collaboration with health professionals and via consumer campaigns. However, education alone will simply not be enough. Dr Caroline Brown spoke about how urban planning to encourage physical activity can best be implemented to address obesity in Scotland. Dr Brown contrasted the treatment and position of walking and cycling in Scotland, and she suggested that big changes are needed. Walking has the highest priority in Scottish Planning Policy, and extensive walking infrastructure exists in Scotland. A significant proportion of trips are made on foot, although walking is usually part of longer journey. In contrast, although cycling is the second highest priority in policy, there is little dedicated infrastructure and only a small proportion of trips are made by bike. Indeed, cycling conditions deter the vast majority of the population from cycling. There is hope, and the strategies adopted in Seville between 2006 and 2011 are an example of what can be done. An increase in segregated cycle ways from 12km to 164km led to an increase in cycle trips from 3.0 million to 16.3 million per year. Cycling now accounts for around 6% of all trips. Breakout groups then considered different policy interventions and how they could make a difference to people’s lives over the coming years. 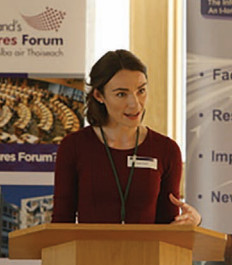 Chaired by Neil Findlay MSP, Health and Sport Committee Convener, this seminar will also help inform the Parliament’s scrutiny of the 2018 Scottish Government obesity strategy.